As it happened, nobody seemed to love it. I wrote a small book and I sent it away to publishers and they told me, with great kindness, but very patronisingly, that I should write more action into it; turn it into a feminine Bravo Two Zero. Apparently the day to day boring stuff that the support arms of the British Army weren’t exciting enough. They wanted me charging into enemy territory like a one woman ferocious Army, armed to the teeth, fighting off hundreds of Iraqi soldiers intent on capturing me and delivering a fate worse than death, hiding under bushes in the desert from Iraqi troops… maybe even me killing some nasty big enemy soldier with my bare hands. You know the sort of thing… the things that all men dream they are capable of doing. Because the trials and tribulations of a woman in the last male bastion of chauvenism obviously weren’t going to cut it, I almost gave up on the writing. I then tried a fantasy story in the children’s genre and it sucked, so I thought that maybe writing wasn’t for me and I stopped doing it. A few years rolled by and I found myself travelling back from staying with a friend up in Telford in Shropshire for the weekend. As usual, the west side of the country, going north to south was very badly served with trains at that time in the late 1990s. There was no direct train from Telford to Fleet in Hampshire which is where I live. You had to travel from Telford to Wolverhampton, Wolverhampton to Manchester in order to catch a direct train to Basingstoke and then change for a local train to Fleet. The first two portions of the journey were quite painless, but when I got to Manchester Piccadilly station, I realised that I now faced a four hour wait for the connection to the south. And even worse… I didn’t have anything to read. I traipsed along Manchester Piccadilly British Rail station, which is an horrifically designed place, where to get onto any of the platforms you had to go upstairs, stagger along with your suitcase or bag and then stagger downstairs to the relevant platform. If the announcer blared out the information that your train would now go from a different platform you then had to repeat the exercise. It was exhausting and irritating to say the least. However, I decided that I couldn’t sit on the dreary platform for four hours without reading matter, I dragged myself and my bag up to W H Smith, on the main concourse where I found a book called From the Ashes of Angels by Andrew Collins. It was an academic book based on the myths surrounding the Watchers, or the Fallen Angels. I spent the time waiting for the train completely buried in the book; it was fascinating and by the time I got home I was all fired up to find out more information. I read articles, more books, mostly academic, and ended up with a brain filled with facts and figures about the Grigori, Watchers, Annunaki, and angels. So one morning I woke up and thought, what on earth am I supposed to do with all of this knowledge on this subject? I didn’t decide to do a book immediately; it wasn’t one of those “Let’s do the show right here!” moments. It was just a slow realisation that somehow I might be able to weave it all into a book. My first book, or at least the premise, was born. I could make the angels who fell from grace survive. They were immortal, if some survived their culling and banded together in order to live on through the millennia, they might be a very different group in modern times; an ancient group of beings calling themselves the Grigori and living alongside humankind. Yet that wasn’t enough for a story. The whole thing had to have a plot, so why not have a rogue member of the Grigori trying to revive the soul of the leader of their group in ancient times… Semjaza… condemned for his crimes of giving knowledge to mankind to hang upside down in the belt of Orion, one eye open and the other shut, his mouth stitched up so that he couldn’t speak the forbidden secret name of God… a name that when he was living, he gave willingly to his human lover Ishtahar in return for her sexual favours. I created two human characters, two British police officers who get caught up in the crimes of the rogue Grigori as he tortures and sacrifices young girls, leaving dead bodies littered across England and France in an effort to create the situation where one soul, that of Semjaza, could be exchanged with the pure soul of an innocent by the ancient ritual of Sila Ag Bar (Sumerian for Path of the Soul). Thus Detective Sergeant Eve Hallam, flawed, damaged and sceptical, and Detective Chief Inspector Roger Hamilton, handsome, perfect life, perfect family and former colleague of Eve wandered into my story, squabbling as they came with the intimacy only old friends can achieve with each other. 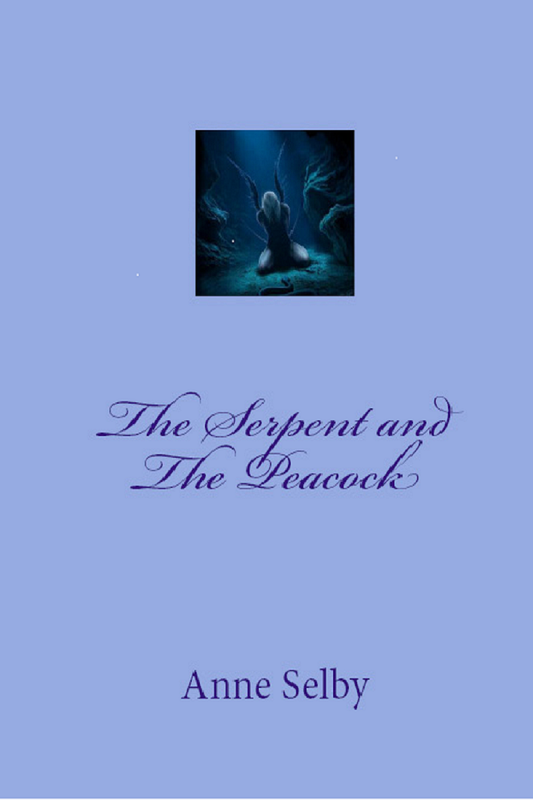 The Serpent and the Peacock by Anne Selby was born. Finally published in March 2011, just before I was diagnosed with Acute Myeloid Leukaemia. This entry was posted in Daily Diary. Anne, thanks for making me laugh. Out of interest what did you do with that first MS, you know I served myself…I’d love to read it! Oh my lord, I have no idea, I think it’s on one of those old floppy disks somewhere. I must look it out and see if I can convert it! If I can, I’ll let you see it. No problem about the laughing, If I’ve learned one thing in 62 years it’s that laughter is much better than tears or anger!